Highest ever Quarterly sales of RE motorcycles registering a growth of 38% at 173838 units. Three new colours introduced for classic 350 have been received well by the customers. VE Commercial Vehicle however showed decline in market share from 13.3% to 12.1%. Sub 5 ton market – Company is new in this segment but was able to secure a market share of 19% by selling 460 units out of the total industry sales of over 2400 units. 5-15 Ton – Eicher registered a decline in market share from 35.4% to 31.7%. Industry slaes were also down to 17000 units, of which Eicher sold 5400. 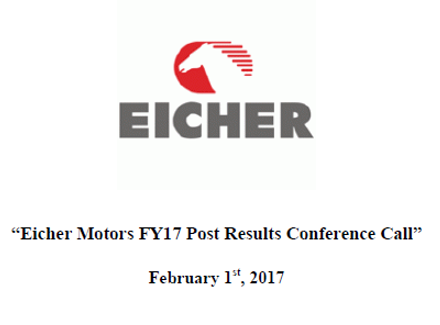 16 ton – Again Industry showed a drop of 8% and Eicher sales dropped more drastically by 12% which shrunk the market share from 4.2% to 4%. Buses: Industry showed a growth of 23% but the Company sales grew only by 13% which is reflected in the decline on market share by 1.2% and is at 12.8% presently. Volvo – mining tipper : 322 Units were which is 9% lower QOQ basis. Medium duty engine sales were up by 24% QOQ at 5848 units. Eicher-Polaris JV – Eicher is expanding its distribution footprint through Multix. It recently launched BS IV models and is expecting a pre-buy effect due to this. Capacity expansion in Chennai is expected to be commissioned in Q3 of FY 17-18. No immediate concerns over Raw material costs presently. Besides the cost is driven by product mix in this sphere. On the VCV Side, Co. has reduced its discounts. As on December 2016, company had a total of 640 dealers with new retail identity that helped in increasing footfalls and conversions. These 640 outlets cover roughly 400 Cities. As per the plans, 100 new dealers are expected to be added every year. Gear Showrooms - 6 exclusive Gear Showrooms operating but the parts are available in 75% of the stores. Sale of Gears is expected to grow fast due to growth in bike sales. Dealer addition is more towards smaller towns. The growth is more or less evenly distributed in small-mid cities. RE Himalayan was launched outside India for the first time in Australia and Columbia in November 2016, with first exclusive store opening in Australia. New technical centre in the UK is on progressing. There was a limited impact of demonetisation and political issues in Chennai in this quarter. However these developments did not affect bookings and sales. There was some postponement in the bookings by customers in November which normalised in December. The Company was not forced to modify any business terms due to demonetization. The VE Commercial vehicle sales dropped by 9% due to demonetisation but YTD growth were at 12% cushioning the drop comfortably .